This Log Sauna is made out of 38mm clear Canadian Western Red Cedar (WRC) interlocking logs for the best insulation and sauna experience. 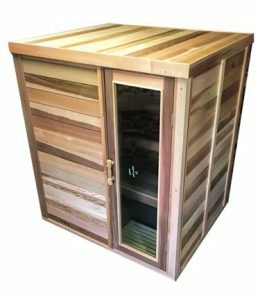 All Ukko Cedar Log saunas are 100% Australian made and come with 3 years structural guarantee direct from Sydney factory. This traditional Finnish hot rock log sauna is perfect for outdoor and indoor installations. It is easy to install simply follow supplied installation manual. You can even choose which way the door opens. And if you stuck during the process, there's always 24/7 phone or email support available at no extra cost.